A group revolving around the closed species Seagons! Discord Server RulesFinally, there's a discord server for the group! Please go over all the rules before sending a note to the group for the discord link! Upon arrival, please take the time to introduce yourself in the introductions channel and change or add your dA username to your discord nickname so we know who you are. This is very important to follow! Please be sure to go over all the channel descriptions! Do not post unrelated content in the channels. This server does not condone super explicit or sexual conversations! Please keep the conversations to PG-13 for everyone’s comfort. Swearing is allowed, but please refrain from using it in a malicious way towards another member. Please be respectful to your fellow members within the server! If there are personal problems, please keep it outside. With spring now in full bloom, the imagery of colorfully painted eggs can be seen everywhere, as everyone begins to set up for the annual egg hunt! Pastel decorations brighten up the shops in the streets while the smell of fresh baked goods fill the air. Although the egg hunt is meant for fun, it is a tradition upheld to signify and commemorate fertility and good health, as spring is known for breeding season, which means a lot of new faces can be seen hatching out from some of the eggs. Those that participate in the events below will be entered into a raffle to win prizes! Be sure to check out the map for background references on the world of Draconia. If you do not have a Seagon, you are free to use Bell, one of the Seagon Mascots (listed below on the right)! #1 (Worth 1 Ticket. No background necessary): Painting eggs in colorful and wild patterns, whether the egg be large or small, is a long time tradition in Draconia. Do they have any sort of artistic ability? Are they having trouble or are they a master of the arts? Is their process clean or are they covered in paint by the time they're done? Draw your Seagon/Drem painting an egg or multiple eggs! #2 (Worth 2 Ticket. Background necessary): Once the eggs are painted and dried, then comes the need to sneakily hide them in various places for others to find on the day of the egg hunt. Where will your Draconian decide to hide their eggs? Is it in a bush, on the roof, maybe in someone's expensive pottery? Show us where in a drawing! #3 (Worth 2 Tickets. Background necessary): Now that all the eggs are hidden, it's time to grab your baskets and get ready to search! The world of Draconia is HUGE, so the possibilities of where you can find eggs seems almost endless. What does their basket look like? How many eggs have they found? Are they stumped finding them or have they got a huge haul? Are they looking by themselves or with a friend? Draw your Seagon finding eggs! #4 (Worth 1 Ticket. No background necessary): While eggs are the main event of the egg hunt, let's not forget the delicious baked goods that Draconians make during this time! There is a baking contest that is held around this time in various locations with eager bakers competing to show off their skills. Of course, there are also those who are more casual about it and prefer to bake just for fun. A lot of the baked goods often show imagery of painted eggs, flowers, and other spring related themes. What does your Seagon/Drem decide to make? Are they good or bad at baking? Show us in a drawing! For any additional Seagons/Drems drawn into the prompt, you will get an additional +1 Ticket added per prompt. The character must be owned by someone else for this to count! You can find volunteer Seagon/Drems here: Seagon/Drem Gift Art Permissions. Only one extra ticket per prompt no matter how many extra characters you add in. The prizes are...eggs! You're sure that you saw it move, or maybe that was just your imagination? Seems that the prizes have yet to hatch, so you'll just have to wait until the end of the event to find out. The number of eggs handed out will be determined by the number of participants! 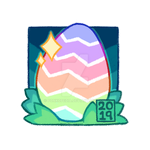 In addition to the mystery prizes, all members who participate will receive the Egg Hunt Event 2019 Badge! Background must depict a location with enough detail to clearly understand what's going on. Backgrounds can also be vignettes. Be sure to reply to the correct comment below labeled "REPLY HERE WITH ENTRIES" with a link to your drawing to receive your raffle tickets along with the prompt number you did. Only one submission per prompt allowed! Meaning you can do all listed prompts, but you cannot draw repeating prompts. EVENT ENDS MAY 12TH 11:59PM CENTRAL TIME! Aaah! They are so cute! Too bad there's no adopts open or any MYO slots open, I would buy one in a heart beat!!!! awe thank you! i'll hopefully have more adopts of them in the future! if i open up MYO slots, would you like to be pinged? How much is a common dragon slot? they are currently $16/1600 ! Did myo for this cute specie are still open? I would love to buy one!